Plush allows you to create your perfect sofa and living space by choosing from a wide range of styles, configurations, designer fabrics or 100% genuine leather. 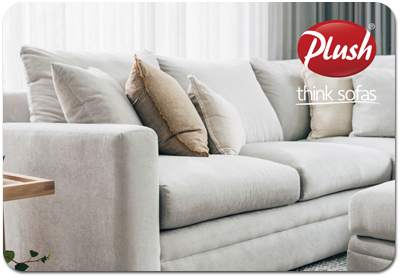 With a new total of 43 showrooms across the country, Plush continues to build on its reputation as Australia sofas specialist by backing all of our sofas with an amazing 10 Year Peace of Mind Warranty. Gift Cards can be redeemed for merchandise from any Plush showroom to the extent of the value of the card. Plush will not accept any responsibility for any lost, stolen, destroyed or defaced cards. Change will not be given. The card is valid for 36 months from the date of issue. Card may not be used as payment of an existing account or lay-by. The Card cannot be exchanged for cash, cheque or external credit. Gift card cannot be used for online or phone order purchases. Any unused balance will not be refunded or credited on expiry.